I did the quilting on this today. It was fun, and I like it! I will be sending it off to my partner soon...just needs binding and a label, and it will be done! Vicki~ very sweet little quilt~ I'm sure she'll be pleased! Oh, I love it! That is so much fun! I especially love the pinwheels across the bottom (I have a thing for pinwheels). 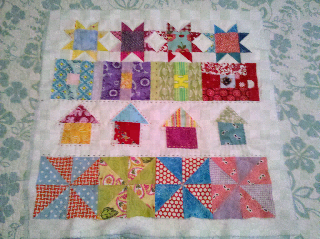 The colors are so bright and cheery and the blocks are just so cute! I'm sure your partner will love it! Hi! De-lurking to say that I love this little quilt! So very cute! Oh gosh Vicki. So so incredibly cute.